Home/Treatments/Facial Treatments/Want a more radiant skin? The PRP treatment has been used since the 90s to help accelerate the healing of wounds as well as help athletes recover from their injuries. A likely familiar example would be the tennis player, Rafael Nadal. WHAT IS A VAMPIRELLA FACIAL? 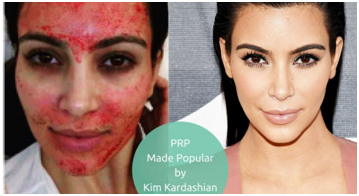 The Vampirella Facial, also know as a Platelet-Rich Plasma (PRP) treatment, is a regenerative facial treatment, which uses nothing but your own blood. Most aesthetic doctors agree that this facial is one of the best anti-aging procedures available on the market. The Vampirella Facial, or Platelet Rich Plasma (PRP) harnesses your body’s natural healing powers and helps repair and regenerate tissue, leaving your skin smoother and more even in colour. It involves extracting blood from your arm into a special test tube. The blood is then spun in a centrifuge so that it separates the plasma, which is rich in platelets (the part of the blood with high concentration of growth factors) from the red and white blood cells. The next steps involve using a micro-needling device to create multiple micro-punctures on the surface of the skin (tiny needles on the head move up & down at 8000 times per minute), driving the isolated growth factors into the skin and creating stimulus for tightening and rejuvenation of the collagen of the face. The aesthetic doctor will then apply the plasma onto the skin so that the growth factors can soak into the tissue. This allows for further stimulation of skin tightening and skin rejuvenating action. WHAT ARE THE BENEFITS OF A VAMPIRELLA FACIAL? After a vampirella facial, you can expect a more radiant skin and improved appearance of wrinkles, and scars. The area underneath the eyes are rejuvenated and your facial features plump up. The reason why this procedure is highly effective in regenerating the skin is because the growth factors in the plasma activate the stem cells already in the skin and trick them into thinking there’s been an injury causing new younger tissue to generate. Results appear within weeks and they will further develop over the following 2-3 months. For long-lasting results for up to 18 months, 3 sessions spaced 6 weeks apart are recommended. Before the plasma is injected, an anesthetic cream is applied to the surface of the face making the treatment relatively painless. The Vampirella Facial uses your own blood and therefore there is minimal risk of complications. Your face will look a bit red and swollen immediately after the procedure but it will settle after a couple of hours. Temporary minor bruising may occur. The Vampirella facial costs R 5000.